Scarcely necessary to add the backstory. Is #AAA even imaginable in this environment? ADDED: Elfwick and the Duck in USA Today. ADDED: The other master of trolling on this issue. @jokeocracy blackness is being gentrified, soon blacks won't be able to afford it and will have to move to another skin color. The Muslim Atheist thing has to be trolling. He’s a man and a woman. What else could he come up with? A midget NBA player? AIDS patient with auto-immune disease? I’m all for it though. Let’s fund this guy. He’s a genius, who’s trolled the BBC twice. Just read further. He’s very good indeed. I was born to middle class parents but I identify as being wealthy. wow this white woman that pretends to be black and is the head of the NAACP in Spokane WA is from Troy MT that about 14 miles through the woods from my homestead. There is no smaller or whiter town on earth. troy is a tine one street logging mining town that doesn’t even have paved sidewalks. there’s no black people for hundreds of miles. Her story, as told by relatives and associates, begins in Montana, where her parents say that they are Caucasian and European (“Czech, German and a few other things”), and that their daughter is white, too. 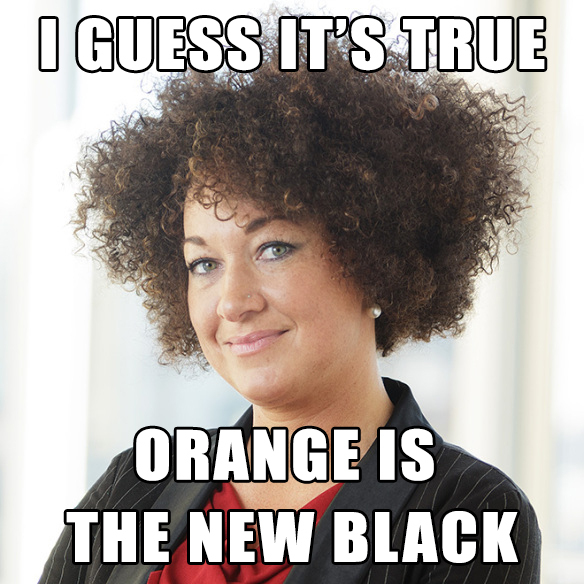 Dolezal was raised alongside the four black children her parents adopted. She later spent a great deal of time in black communities during college, attending graduate school at Howard University, which is referred to as the “Mecca” for its central place in black scholarship. In January, Dolezal was elected president of Spokane’s NAACP chapter, where she drew attention after claiming to be the victim of a number of hate crimes. “Race is a social construct.” If that’s the principle, then look what springs from that. Just like gender. We can all be whatever we want to be and yet, that fails The Narrative as well because then victimhood is abolished. That there are people who don’t realize this is a troll might be the best argument for eugenics I’ve seen this week. Be nice. Not everyone’s genes are fully adapted to living inside a worldwide insane asylum. If your movement consists of a massive troll of Western Civilization, you are extremely vulnerable to entryism by trolls. The SJWs have been subverted. I am… in awe. I love this species so much. Go Godfrey, shatter the prison of the mind! We shall be free. Which racial identity is more privileged? Revealed preference says blacks. @Orthodox Oh please let Bill or one of the Bushes come out as transblack and usurp the title of first black POTUS. What Michael said. Jeb speaks Spanish at home because his wife never bothered to learn proper English. And he speaks a lot more forthrightly to Latino audiences in their tongue than to, well, anyone else else in English. I’m still surprised no one commented on the ‘transabled’ link I posted in the Chaos Patch. Imagine being female, black (but not really) , gay + limbless, deaf, dumb, and blind… . Royal flush. In today’s Cathedral they raise the robes to confirm absence of privilege. Where’s the advocacy for the rights of BDDs? I just can’t tell whether or not “One Hand Jason” is trolling the Toronto Sun. Our “news” these days is basically indistinguishable from parody. Indeed (haven’t played Hold ’em for a while). Fresh BS to normalise, roll up! roll up! Schadenfreude — it’s just awesome watching the left eat itself for breakfast. Stumbled across this on imgur. There is no trolling after Godfrey Elfwick, this guy, whoever he is, is amazing. That more than a few of his victims are whites outraged that another white is trying do defect from whiteness says something about WNs, being that those outraged whites are exactly the types who WNs are trying to cultivate and politically mobilize.